At some point, We’re going to have to stop being being amazed at how little the left has learned about American voters since Trump’s election. The Doug Jones-Roy Moore race in Alabama is a great example. It’s not today, though. The way that Democrats have conducted Democratic Doug Jones’ campaign for Alabama’s U.S. Senate seat to replace Jeff Sessions once again shows they’ve learned nothing from the 2016 election and that they are willing to lose every ounce of leverage that a contentious Trumper could give them. As we said when Moore won his primary over Luther Strange, this is a big election for the Republican Party that could turn Congress’ power away from the stale establishment McConnell camp of the GOP and to a fierce new breed of grassroots politicians emboldened by the president. The GOP primary for this seat was essentially a fight between establishment Republicans backing Strange and Steve Bannon conservatism going for Moore. Alabamians will soon elect a new U.S. Senator and I hope they will vote for the candidate who will follow in former Senator (Jeff) Sessions’ footsteps as a tireless advocate led by principle rather than politics,” Cornyn said in a statement released by the Moore campaign. It almost goes without saying that Moore is going to be a lightning rod of controversy if elected. In a lot of ways it’s already happened. Mainstream media outlets are doing everything they can to disparage Moore, with some conservative outlets like the National Review surprisingly even chipping in on the hate. Despite that, Moore has raised over $2.5 million in a special election, which is almost a million bucks more than Jones has despite all the fire from other Republicans. Jones isn’t doing himself any favors either, with him recently telling a state media outlet that he’s “tired of Alabama being an embarrassment to the country.” Folks in Alabama are right to get mad at that kind of talk, especially from someone who expects to be elected to a federal seat. And for a guy who would do well to ingratiate himself with conservative voters who make up a majority of the Alabama electorate, Jones can’t stop shooting himself in the foot with a constant barrage of talk about loving abortion and supporting minimum wage hikes. Of course Jones didn’t stop at that – what’ll really go over well is his outspoken position in favor of transgendered people in women’s bathrooms and in foxholes with the troops. So if you’re an Alabama voter, you have the national media constantly calling you a yokel, the Democratic candidate telling you he’s embarrassed to share the same state as you and a Republican candidate who, while he can be a little rough around the edges and who specializes in triggering the old Neil Young crowd, is nevertheless backed on both ends of the GOP and willing to become a prominent voice in the culture wars. You don’t have to be a genius to see where this is going, especially considering the election we had last year. Nevertheless, a week ago a Fox poll showed Jones and Moore tied in the race, which was heralded as a signal Moore couldn’t win. That was before the public began paying attention to what Jones actually believes. On Monday, things began coming back to normal, as a Strategy Research poll by Fox affiliate WALA in Mobile showed Moore with a 52-41 advantage. Election Day is December 12. It could be that from here on in the two candidates will be locked in a battle of who can do the best job of shutting up. 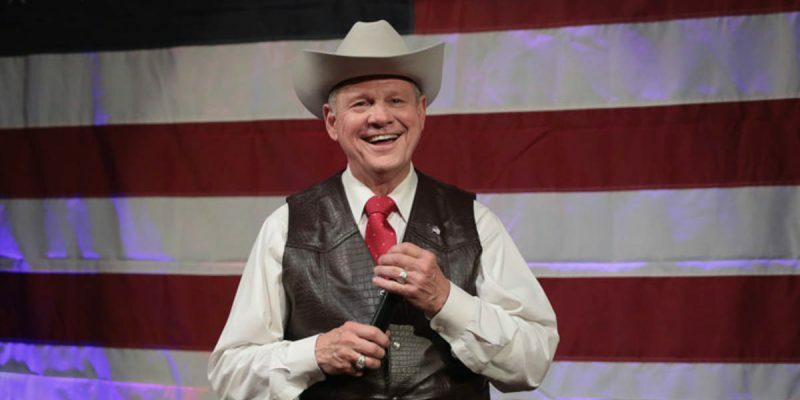 Moore’s positions are well known and agreed with by the majority of Alabama voters, if he might be needlessly controversial in how he expresses them. But Jones can’t afford to express his positions – his brand of cultural leftism infuriates voters, and the more he says the worse off he is regardless of how friendly he might sound.